I headed up to the rocklands for a couple days to check out some world-class bouldering, and possibly get eaten by a leopard. The place is pretty cool, loads of rock for miles in any direction, with Mutual of Omaha's Wild Kingdom living in between. I got on some fun problems, but I kept getting more and more tentative to slap blindly for holds after seeing all the spiders, snakes, and assorded angry critters living in them. Next stop was Montagu, the western cape's premier sport climbing destination area, and home to absolutely no climbers at the moment. 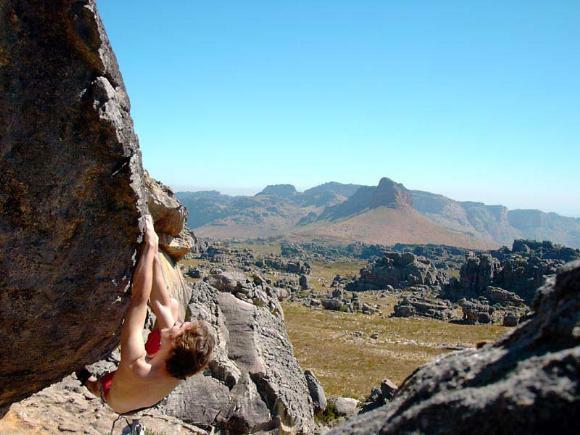 Nobody to climb with, hence no real reason for me to be at the western cape's premier sport climbing destination area. In fact, in the short time I've been down here, I have become convinced that I am the only travelling rock climber in all of South Africa. Looks like I'll stick to bouldering. Anyway, I'll probably tourist up the joint in Cape Town for a couple days more before heading east. If I'm feeling lucky, next stop will be Outdoorshoorn and the awesome limestone with likely zero partners to be had. Otherwise, it's off to J-Bay to find some waves. I spent the better half of last week in a pitched battle for control of my belly. I escalated to antibiotics, and came out the victor. Got back on the rock yesterday and today I was finally starting to hit stride. Got a 7a and worked out a new sequence for a tough 7b that I squeaked by on last time I was here. That's .11d and .12b for the non-french. But none of that will matter soon, as I am about to become a huge movie star in Thailand! I was sitting in a cafe on the beach, reading a book and toying with the remains of my pad thai this afternoon, when a couple thai girls came up and asked if I'd like to be in a ice cream commercial. But of course. Why else would I be waiting here? They took a bunch of photos and videotaped me walking up to the camera and smiling and talking about how much I enjoyed partying on the beach and eating ice cream. It was hilarious. Anyway, if I make the cut, they'll ship me and fifteen other superficial looking farang off to some beach in Trang provence for a week. There's even some baht in the deal. So yeah, that's my story for the day. I'll keep you posted on my soon to be illustrious career as an actor! So I blew through my 30 day visa without leaving the beach. I'll probably do the same with the new one too. Yessir, traveling far and wide these days. Ok, I guess I did make it down to Malaysia for a week, but really only to take care of the visa situation and eat a whole bunch of noodles in Chinatown. One of the beaches that I checked out is only accessable by walking through a cave. And not just one of those duck-under-these-few-rocks caves, but a full on better-have-a-second-light-source cave. With bats. On the way back, I got rained off the road and into a random little restaurant/shack, where I got to practice my Thai for a few hours with the locals. I still have a long way to go before I can master this language. 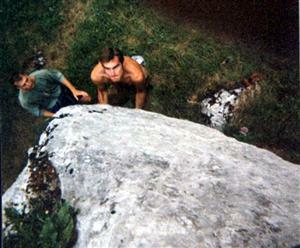 Climbing goes well. Flashed a .12a yesterday, just missed flashing another one today, then spent the morning falling off a .13a just for fun. Dude. I'm running out of things to report over here. Somehow, the fact that I'm still here doing the same stuff as last month does not seem all that newsworthy. I am, however, consistently onsighting .12a, so I guess that's nice. Me and Jay rented motorbikes the other day and went tearing around the county. It was awesome, and hardly disastrous at all. Jay only made it over the handlebars once, and not even into traffic. I'll certainly be back for more. So Thailand is treating me pretty well thus far. Beautiful weather, great beach, clear water, perfect rock, couldn't ask for much more. foot section where you gain 3 feet of elevation! Completely unlike anything I've been on. It's all sorts of fun, and plenty hard as well. I've put three days into it so far, and only just this morning finally got to see the top. That doesn't mean I'm done by any means. Now I get to spend the next few days linking together moves and trying to get the whole thing in one go. Anyway, things go well. Plenty to climb, plenty of time relaxing on the beach, even some diving in the cards. See ya! So life in Paradise continues to be nothing but good. I made it out diving the other day, and it was the best I've ever seen. Ridiculous amounts of fish, anenomae and assorted critters. You'd lose sight of your dive buddy because there'd be 15,000 young barracuda in the way. Our first dive of the day was on this passenger ferry that sank a few years back. The main deck is like 24m down and it's upright and in good condition. It's fun and a bit spooky cruising around inside the thing, as all the divers stir up the water & visibility is reduced to just a few meters. Being a boat, it has plenty of narrow doors and confined spaces to swim through. Definitely a cool experience! And for those of you keeping score, I've put in a total of six days on the route now. Only a couple burns a day recently, since I have all the moves wired now, and I'm just trying to put together a clean ascent. I can get it with one rest along the way now. Now I'm just moving that rest spot gradually downward until I can cast off straight from the sand. I generally try not to actually engage them in conversation. You can usually tell from a distance, though some do a really good job of looking the part! Bali has some truly amazing waves that I have no intention of paddling out to anytime in the near future. I spent part of today day at Ulu Watu when it wasn't even on, and it looked plenty mean. There's rock here, by the way. I'm going to do some scoping over the next week to see if we should be planning a future expedition w/ Hilti in tow. There's definately enough bouldering on the beach to keep a fella occupied for a while. So they got rocks here. I spent an afternoon bouldering at one of the local surf breaks and getting strange reactions from the locals. I guess nobody had ever climbed there before. I'll be renting a motorbike and doing some exploring over the next few days. There seems to be some good potential. Believe it or not, if you spend enough time sipping Mai Tais on a tropical beach, you will eventually get bored of it. After 4 months in Thailand, I was ready for a change. How about a last minute, 60 day return ticket to Australia? I hear they've got surf there. So, with the promise of another couple weeks client work (for real money), I booked a crazy plush holiday flat in Noosa Heads for myself and the lovely miss Helen. Bought some surfboards, wrote some code, surfed a bunch, lived large. Bought a cheap van off an English chick, threw a bit more money at it so that it might actually run, and headed South in search of right point breaks and wireless hotspots named Linksys and Default. A few new features kept creeping into the site. Somewhere along the way, Tags were born, browsing and search were improved, and the map stopped zooming out to see the entire planet just because you started your trip halfway around the world from where you were actually writing reports. Internet access is actually hard to come across in Australia, so updates would pile up for a while before being thrown live with crossed fingers. 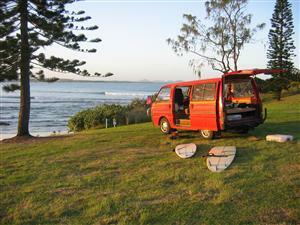 Once we made it to Sydney, the surfboards got stashed in the back and the climbing gear came back out. Spent a week in the Blue Mountains and another at Nowra, clipping bolts with friends met in Thailand. Finally, we limped the van down to Melbourne and passed it off to a friend, who managed to get it halfway back across town before it died a painful death in the middle of rush hour traffic. So phase two of the trip took me to Buoux, this little town in the s. of France with big rocks and a cheap campground. It's takng a while to get calibrated to this overhanging pocketed limestone, but for the most part, climbing is going well. All the english speaking climbers bailed simultaneously a couple days ago, so I headed south to marseilles in search of a sunburn.